As I have mentioned Coral Bay is situated on the edge of a Coral Reef, known as Ningaloo Marine Park. 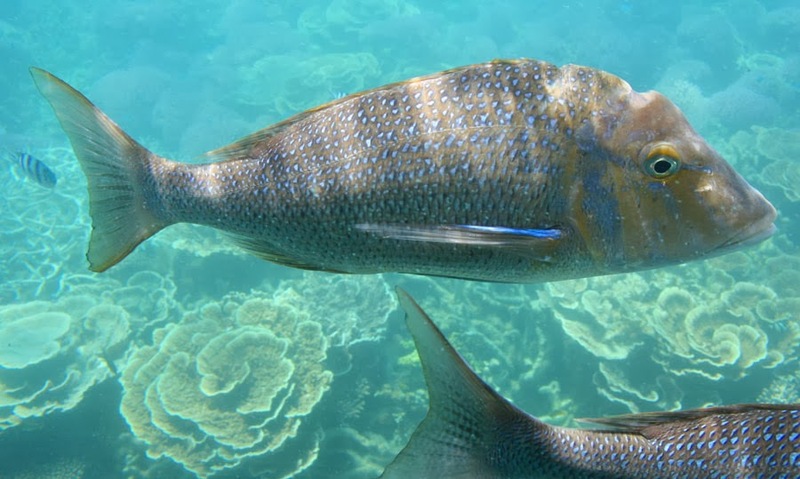 To protect this unique resource, the Ningaloo Marine Park was declared in 1987 and encompasses about 224,000 hectares of State controlled waters and about 700km squared of Commonwealth waters. This reef is unique because it is one of only two coral reefs in the world that have formed on the western side of a continental land mass. 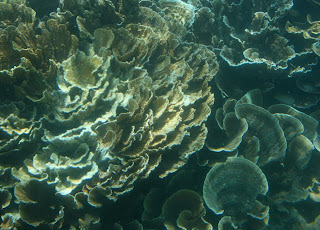 This marine park is home to 200 species of hard coral, 50 soft coral and over 500 species of fish. The reef is also home to Manta rays, Turtles, Humpback Whales and is only one of two places in the world where the Whaleshark regularly visit. In June 2011 Ningaloo Marine Park was listed as a World Heritage Area. World Heritage listing recognises the outstanding universal value of the area's diverse and abundant marine life, it's amazing cave fauna and the spectacular contrast between the colourful underwater scenery and the arid and rugged land of the Cape Range. This morning Shane and I went out on a glass bottomed boat to check out this amazing reef up close. 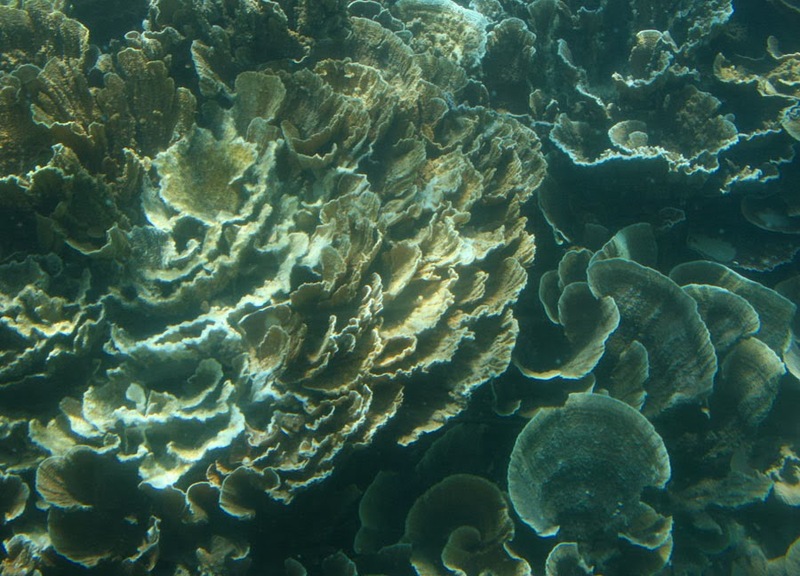 Most people have heard of the Great Barrier Reef in Queensland, on Australia's East Coast. 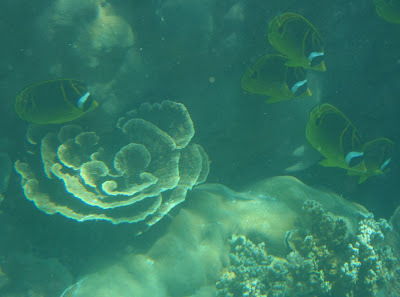 I have also experienced the reef there and they are very different. 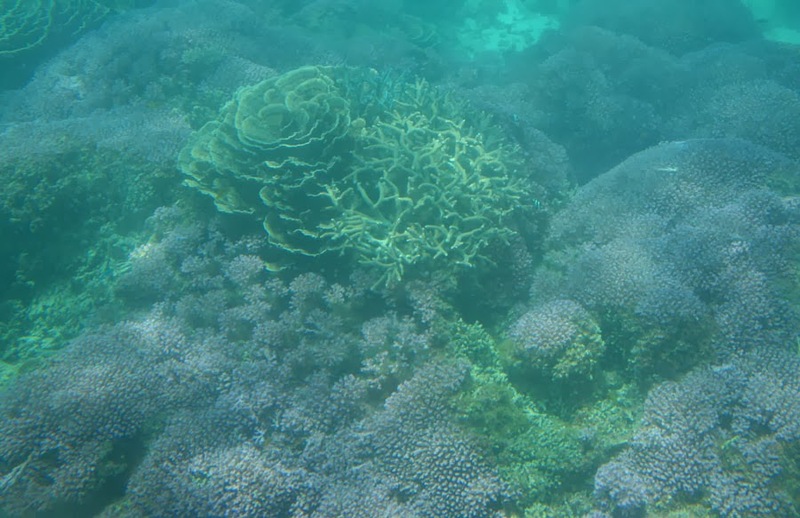 Great Barrier Reef is very colourful and is mostly soft coral due to the large amount of water flowing over it. With Ningaloo Reef most of the reef is sheltered so it doesn't have the bright colours, but the coral formations are huge with some beautiful coloured fish. Sweet Lip / Snapper - oh if only you could fish here!! 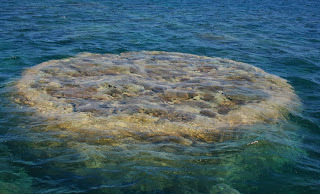 Looking at one of the huge corals from above the water. This one is known as Ayers Rock.